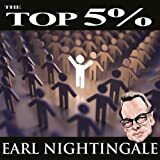 Six Steps to uncommon achievement and a view from the top.... Earl Nightingale helps you unearth and use the six stepping stones to success - the ideas and approaches that will accelerate your climb to the top five percent of the social and economic pyramid of society. His stepping stones may seem simple: attitude, integrity, the mind, goals, service and rewards, and leadership. But at one time or another, most of us fail to use these important steps in ways that lead us to uncommon achievement.